Juicy blackberries are here! What better way to celebrate the sweet, bursting berries than by throwing them into a crisp, cobbler or any other super summery dessert? Here are 10 beautiful blackberry desserts to make right now. Chef and Le Pain Quotidien founder Alain Coumont makes these ethereal, citrusy custards with wild blackberries gathered from his property. Try them with blueberries, raspberries or pitted cherries, too. A classic British dessert of pureed fruit folded into whipped cream, a fool is one of the first things ceramicist Peter Ting learned to make after moving to England in 1976. 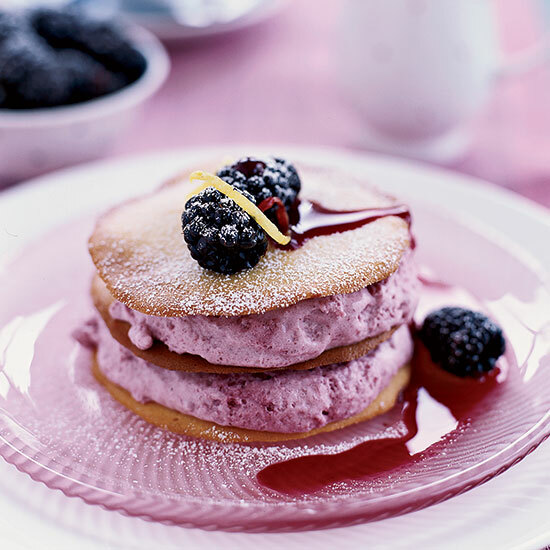 To give this one a little extra sophistication, he macerates half the blackberries overnight in Calvados, then tops the fruit with dollops of whipped cream he's mixed with blackberry puree. This cake gets a bright zing from orange zest and Grand Marnier liqueur. There's nothing better than a bubbling blackberry mix topped with golden, flaky pastry. These crunchy tuiles layered with silky blackberry mousse are wonderfully light and delicate. Ripe blackberries are Mario Batali's "favorite fruit in life." The recipe for this luscious pie is from his mother, Marilyn. Writer Colleen Hubbard turns frozen blackberries into a zippy jam for this pie's lime filling. Light and moist, with an irresistible crispy top, this buttermilk cake has sweet-tart berries in every bite and takes just 20 minutes to prep. It will become your go-to cake whenever blackberries (or even raspberries) are in season. Try this luscious fruit soup as a refreshing alternative to a rich dessert. Serve with your favorite crisp cookies. This pie from Bobby Flay is creamy and crispy, but what sets it over the top is the luscious and silky blackberry caramel made with fresh blackberries and blackberry liqueur.